Sunnking, Inc., an electronics recycling company with facilities in Brockport & Rochester, NY, is proud to announce that they are the first and only R2 (Responsible Recycling) Certified recycling facility in New York State. 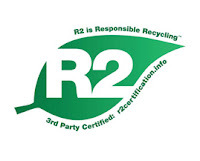 R2 Certification can be compared to the more widely publicized ISO standards, but is specific to the electronics recycling industry, setting requirements relating to environmental, health, safety, and security aspects of recycling electronics and equipment. The certification is a voluntary practice and includes general principles and specific practices for electronics recyclers that dissemble or reclaim used electronics and equipment. Some of the highlights of the R2 certification include; high standards regarding the environmentally responsible processing of disassembled electronics from Sunnking’s properly licensed downstream vendors, as well as strict guidelines concerning the secure handling, wiping, and destruction of personal data from storage devices found in electronics such as desktops, laptops, copiers, and other devices. Recognizing the need for a comprehensive certification program that captured the operational and environmental concerns of the industry, the EPA convened a multi-stakeholder process to develop the “Responsible Recycling Practices For Use In Accredited Certifications Programs” (R2). The multi-stakeholder group is comprised of the U.S. EPA, regulators from state agencies, electronics recyclers/refurbishers & their trade associations, as well as the manufacturers and customers of electronics recycling services. The R2 Certification is currently housed at R2 Solutions, (www.r2solutions.org), which is a non-profit organization that conducts educational and outreach services and provides administrative support for the multi-stakeholder Governing Council. Sunnking’s R2 Certification coincides with the NYS Electronic Equipment Recycling and Reuse Act, which was signed into law on May 28, 2010 by Governor Patterson and requires manufacturers of electronic equipment (OEM’s) to accept electronic waste for collection, handling, recycling or reuse beginning April 1, 2011. Founded in 2000, Sunnking Inc. is an Electronics Recycling, Data Destruction, & Asset Management company dealing in end of life electronic equipment. Their facilities located in Buffalo, Rochester, and Brockport, NY, specialize in collecting, refurbishing, reselling, and recycling electronic products from residential and commercial suppliers throughout New York State and surrounding areas. For more information please visit our website at www.sunnking.com or contact us at 1-877-860-7866. 0 Comments to "First New York R2 Certified Electronics Recycler"